TORONTO — Vasek Pospisil has had a taste of championship-level tennis over his decade-long run on the ATP World Tour. He's ready to make a push to return to that form for what should be his prime years on the court. "I had a good end of the season, I didn't really have any huge results at big events but I had really good wins," Pospisil said. "I was feeling like I was playing some good tennis." "I feel like I'm playing better tennis now, believe it or not, than I was then," he said in a recent interview. "I just haven't been able to stabilize everything. My situation — be it the fitness side of things, injuries or coaching — it was always something that was not going in the same direction. It's very tough to get confidence or even momentum. You need a bit of luck and you need to also make sure everything is organized. "I feel like I've lacked that a little bit the last few years. I feel like it's more that than necessarily my game. Obviously my work ethic remains and I feel like I'm motivated as ever. That's not the issue. I think that's why I'm relatively confident that I can get back there, hopefully sooner (rather) than later." "The disc has bulged a little bit," Pospisil said. "I also have a minor crack and pretty bad inflammation of the nerve. So I'm just getting referred pain down the leg and the glute." Pospisil, from Vancouver, hasn't pinpointed an exact date to resume training but will likely take at least another week off. The upcoming season is also a big one on the Davis Cup front as Canada boasts its deepest team in recent memory. "I would love to get back to the level that I was at for those three years when I was ranked 25th to 50th, fluctuating around there," Pospisil said. "My best years technically should still be ahead of me. I'm reaching the prime of my career. "I just feel that there's no reason for me not to get back there and hopefully get even higher. It's just a matter of stabilizing everything." 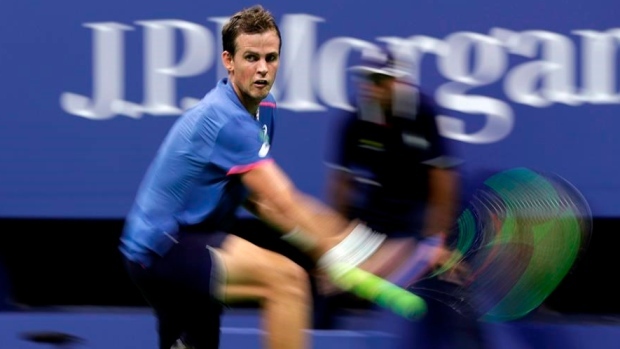 Pospisil, who won four of his six career doubles titles with American Jack Sock, has put the four-man game on the back burner while he focuses on singles. He'll likely pick his spots next season and would likely get the nod — if healthy — for doubles play in Canada's Davis Cup qualifier in early February at Slovakia. "He's really aggressive, he's not scared to go for it," said Canadian teammate Denis Shapovalov. "That's a huge asset that not everybody has. He comes to the net, he likes to finish the points. If he's having an on-day, it's super-tough to play against him. I feel like that's why he's so good at doubles. "He's got unbelievable hands, a big serve, his returns are really good. He can be a really dangerous opponent in my opinion." "I feel like this last year was good, it was stable," he said. "Just a few things to learn from to make that next step to get back to where I was and then from there, it's just details at that point. Everyone plays at a high level once you're at that ranking and in that range. I'm optimistic."